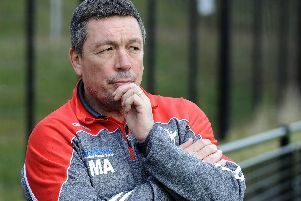 There have been signs of improvement in recent weeks for a clutch of Mark Aston’s group, but the Sheffield Eagles chief says a number of individuals need to start backing up their positive displays. After a break from league action, the Eagles return this weekend with a crucial trip to face fellow strugglers Rochdale Hornets. After their most recent victory against Swinton, Aston singled out a number of performers for praise. But despite showing signs of hitting the standards required, the Eagles took a step backward after being pummelled by Leigh Centurions. For some individuals Aston set the challenge of backing up their better performances, with the likes of Mark Offerdahl and Shaun Pick two examples of players who have shown their capabilities in recent outings. “Without a shadow of a doubt Mark Offerdahl’s best game for us was against Swinton recently,” Aston said. “He has been disappointed, and I have been disappointed with him, we don’t pull any punches here, we are quite open and honest with each other. “One thing about Mark is that all the way from the start he has been open and honest with us. “He is aware that we need more from him and to his credit he has been working hard. “Sometimes when you work hard you get the response that you require. “Certainly there have been signs, especially in the game at Swinton, that we are getting what we require. A shortage of experienced players recently didn’t help the cause against Leigh, but the break has given the likes of Josh Toole, Matty James and Cory Aston the opportunity to return to first-team action. Aston will be pinning his hopes on being able to select from a bigger pool of players, stressing he needs more than a handful of players hitting form. “There have been signs recently that we are getting close to double figures of lads playing well, but it is signs, as I’ve said it before we need it consistently,” he explained. “You have a 17 man team and we need a large percentage of those 17 players playing well. “We are getting more, but we need more.